What’s my old watch worth? 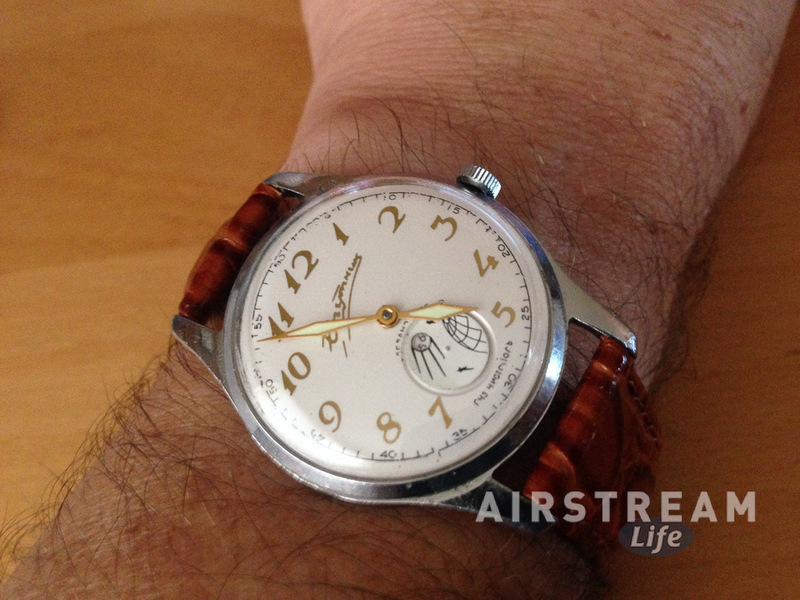 You are here: Home / Musings / What’s my old watch worth? Just now I was winding a watch. Remember doing that? Decades ago we all had mechanical watches, and spending a few seconds every day casually winding the little crown was just something you did without thinking much about it. I like the little break that winding a watch requires. Like pausing to scratch an itch, or sneeze, or tie your shoes, it’s just a tiny moment when you aren’t expected to do anything else, and it buys you a fraction of the day that’s all your own. That might seem very trite but consider that tennis champ John McEnroe used shoe-tying very effectively to throw off his opponents and grab a mini-break during intense matches. Every moment counts, and some can be made to count more than others. In the case of this watch, which happens to be a Soviet “Sputnik” (Спутник) watch made in 1958, there’s a comforting little zik-zik sound that I like to hear. I’m not sure why. Perhaps it’s because it reminds me that the watch is a fragment of history in itself, a commemorative item made in the First Moscow Watch Factory near the peak of the Soviet Union. Just knowing that tickles me. Perhaps it’s simpler than that. I have to admit I like to see the little Sputnik dial rotating as the seconds tick by. The ticking reminds me that this is an entirely mechanical device—no transistors, chips, battery, LCD display—made from tiny bits of geared metal and even tinier synthetic ruby bearings, lightly lubricated by oil, designed in the slide rule era, and powered by a few seconds of zik-zik every day. Such devices are virtually unknown and unappreciated by most people born in the 21st century, but since they still work (in many cases far better than their modern equivalents) I think we should all remember them. I’ve written before about my penchant for vintage devices, which seems to have gotten more acute as I’ve grown older. It’s not nostalgia; most of the mechanical things we have were designed and obsolete before I was born. I don’t recall my mother having a 1948 Mixmaster, but I love the one Eleanor inherited from her father. My fascination is probably because of my father, who was trained as a machinist in his early career, and who had a basement full of fantastic devices for turning metal into mechanical wonders. As a child I could not understand most of the tools. I knew what his lathe could do, but not why I would have any practical reason to spin metal shavings off chunks of metal. I loved hefting the weight of his micrometer and spinning the handle to watch the scale climb with uncanny smoothness. It was a device of intriguing precision (which we associated so much with him that it was brought out at his memorial ceremony). But at no time did I have any idea what I might measure to a thousandth of an inch. I still don’t—but I like that tool. My father made, among many other things, devices called Goldblatt Clamps. He was so useful at making such things that he was given a deferment from the Korean War for a while (he went later). We still have a box of the clamps, made of precious metals such as silver and gold. I have no use for Goldblatt Clamps but the mere idea of them is strangely compelling. I can think of another reason I like the mechanical things. I have an extremely close relationship with the laptop computer that I’m currently typing this on. Airstream Life and most of my current life activities would be impossible without it. I spend all day with it, more time than I spend with my family, which is sort of horrifying if you think about it. I spend more time with this thing than I do eating, sleeping, exercising … pretty much everything except breathing. The computer is a valued tool which I appreciate mostly because it just works for its intended purpose, but it’s essentially a disposable black box. It can be opened but mostly what you’ll see are more black boxes. It works on principles that I intellectually understand but which I cannot touch, and it will inevitably fail for reasons that I cannot determine. When that happens, it will likely not be repairable. Thinking of that, I look at the watch I’m wearing today. It is the antidote to short-lived black boxes. An assembly line of Soviet comrades made this watch 58 years ago and it still works. It may work for another hundred years, given an occasional cleaning and lubrication. Sure, it only does one thing, but that’s not its key value anymore. Now it is a bit of history, a reason to take a 30-second break each day, and a spark of perspective to counter the crazy smartphone world we inhabit. That’s worth more to me than knowing the current time with atomic precision. You might wondering if I’m ever going to talk about Airstreams in this blog. I think I’ll leave making that connection to you, if you see one. Feel free to add your thoughts in the comments. 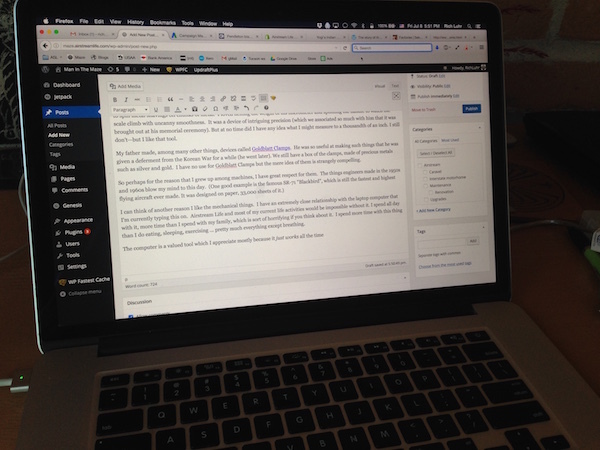 Best blog in a long time…time to become the full-time writer you should be. Wearing a watch is redundant to the under 50 y/o crowd as most consider time to glance wasted when you’re glued to an electronic device. In 1997, my then 17 y/o son’s HS biology class was given a reading assignment….Danko & Stanley’s, “The Millionaire Next Door”. The teach was into ‘biotech’ before the word had been imagined. I knew nothing of this. That’s peculiar, why would you ask ? ‘Because the book I’m reading says a common trait for millionaires is never to spend over $300 for a watch’. So Rich, your Sputnik plus my Bulova, 20 years later, still don’t add up to $300, and we remain safe working on that first million. I’m retired. I don’t wear a watch anymore. My old Omega chronograph is in the drawer for someone else to dispose of. It’s not worth much. But the laptop is a tool that is valuable to me. Keeps me occupied a couple of hours a day. You can write, edit, and publish all on the same tool. Pretty neat.